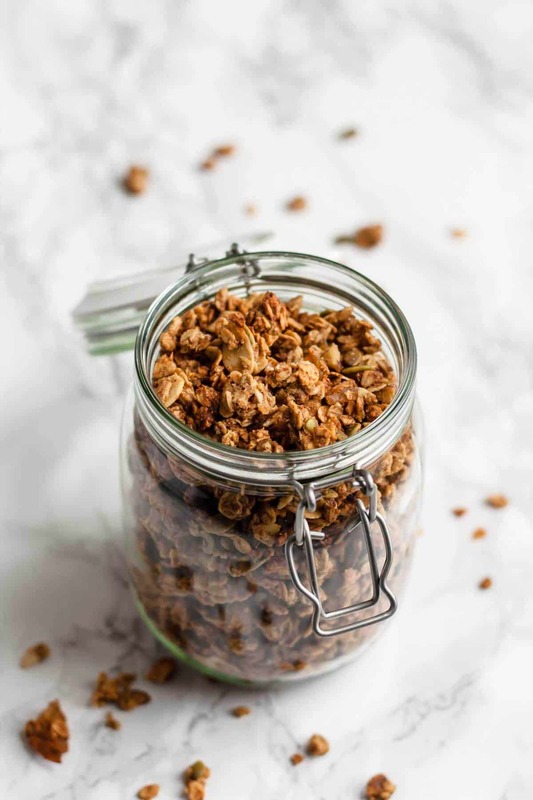 This Healthy Granola with Dates and Ginger is sweetened with medjool dates and packed full of nuts and seeds for a delicious and wholesome snack or breakfast! I’m not normally one for shop-bought granola. I don’t mean to sound snobby or anything, it’s just that I tend to prefer my sugar in dessert form. And you can’t deny that shop-bought granola has a tendency to be sugary. In fact, so can the homemade stuff! But, the other day I indulged and bought a box. It was packed full of salted caramel fudge and crystallized ginger. Oh my goodness, it was so good! Unexpectedly delicious. And probably made even better by the fact that it was such a rare occurrence. It was so good that I knew I needed to recreate it here. So this Healthy Granola with Dates and Ginger was born. And while the word ‘healthy’ is probably a bit of a stretch, I truly believe that a lot of what makes something healthy depends on our attitude. (Definitely need to put that into practice a bit more often though!). That said, this version is pretty virtuous as it’s almost entirely sweetened with medjool dates – which yes, I know are full of sugar, but it’s the natural kind which comes along with all the other nutritional benefits of dates. And I’m totally cool with that! There’s a lot of scaremongering going on around sugar these days but I stand firm in my belief in the virtues of eating a little of everything. This is definitely a lot less sweet than most shop-bought granola though! 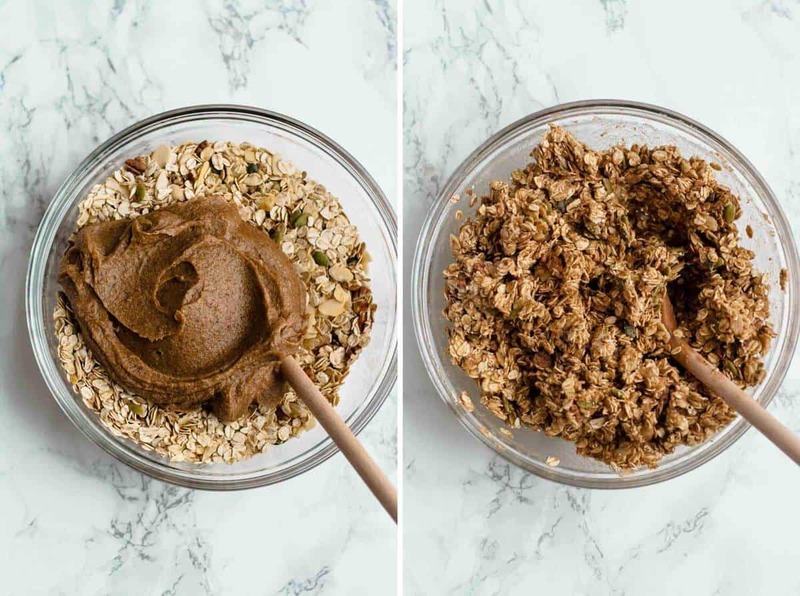 The base of this healthy granola is simple, like many other granola recipes – we’re talking jumbo oats, almonds, pumpkin seeds and pecans – but you can of course switch these up according to your preference. Next, I added some crystallized ginger for a touch of heat and chewy texture but the winner here is the luscious salted date caramel I used to sweeten the whole shebang. I mean, wow. This stuff is next-level good. (And I feel like it’s going to have to feature in another recipe soon to really showcase it’s awesomeness.) I mean just look at it! LOOK. Don’t you just want to dive face-first into those caramel-y swirls? You just know it’s going to be good, right? 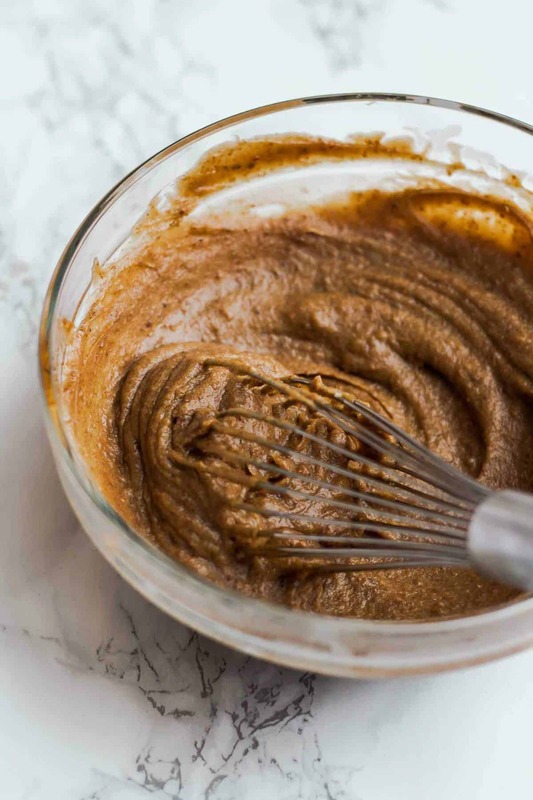 The salted date caramel is made with medjool dates (duh), almond butter, coconut oil and a few added extras to amp up the flavour. So good, you guys. So good. The caramel gets mixed into the granola base, spread out on a tray and baked gently. 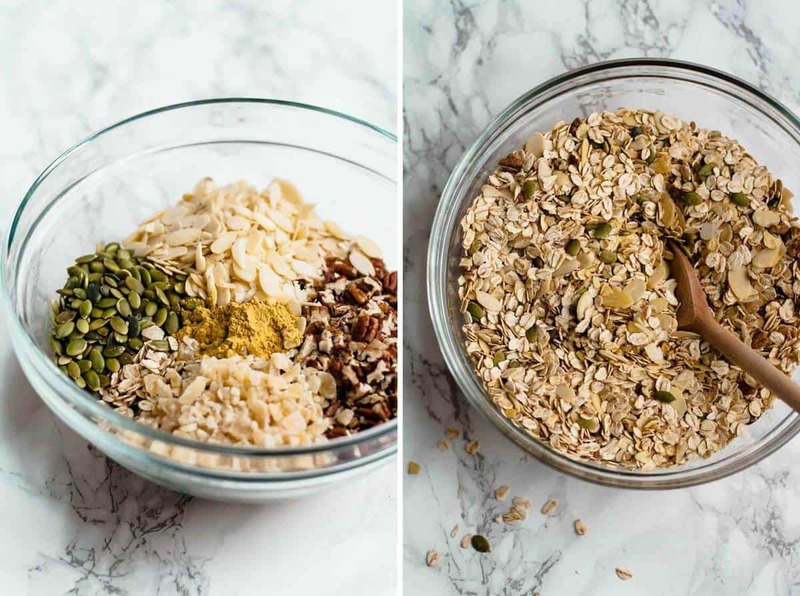 An hour or so later, you have yummy healthy granola to sprinkle on all the things. Yes! This granola is a little softer than you might expect when it first comes out of the oven, but it turns nice and crunchy and soon as it cools down. And it’s clumpy too – yay! If you’re more patient than me and turn it really carefully as it bakes, then I’m confident that you could get even bigger clumps than I did. But I didn’t, because I’m not patient when it comes to these things. I’m selectively patient – but granola-turning-duty doesn’t qualify I’m afraid. I have to ask my husband to do things like that. You win some, you lose some, right? 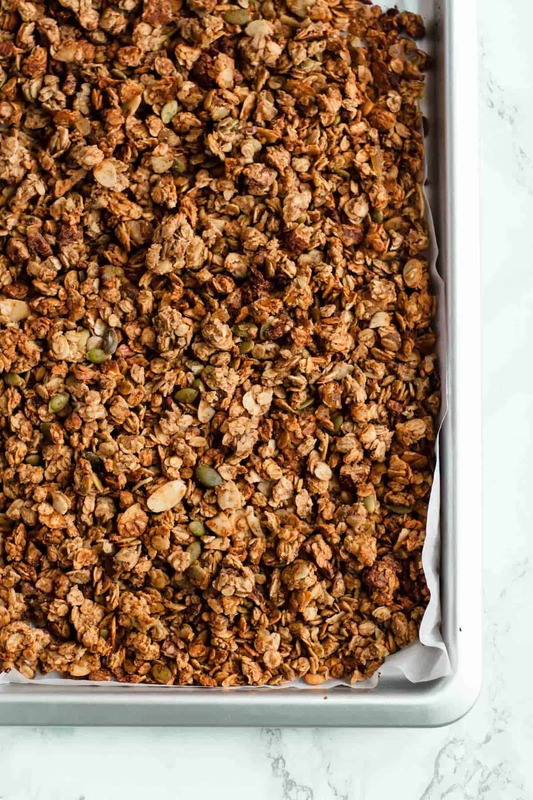 But seriously – why is it so satisfying to eat one giant piece of granola? Blitz together the pitted dates and the water to form a thick, smooth paste. I used a stick blender and a jug for this and it worked perfectly, but you could use a blender if you prefer. You just want to get it nice and smooth! In a large mixing bowl, mix together the oats, pecans, almonds, pumpkin seeds, crystallized ginger and ground ginger. Pour in the caramel and stir until well combined. 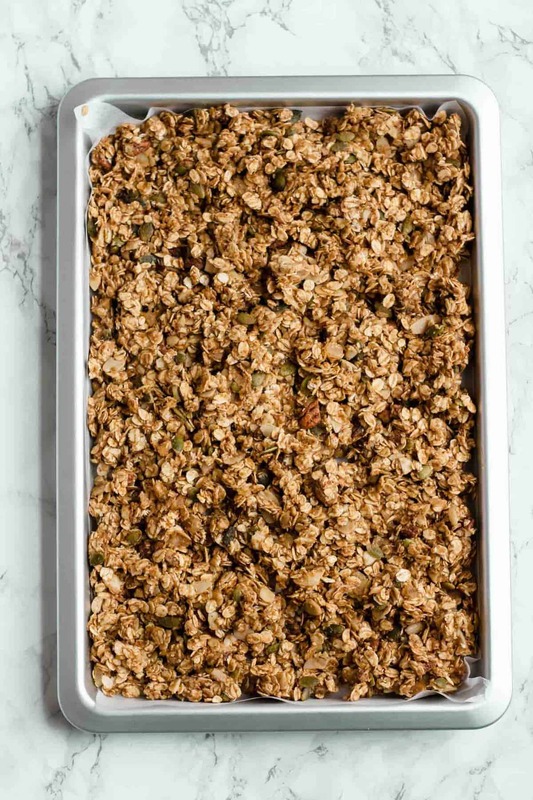 Spread out on a lined baking sheet and bake for about 1 hour, turning the granola carefully once or twice during the cooking time. It's ready once it's nice and golden brown and mostly dried out - it will continue to crisp as it cools. Leave to cool completely before transferring to a jar or large ziplock bag to store.